IHAA’s residence is made up of 47 bedrooms within 21 apartments which are located in two wings: Dotson and Harper. The Dotson wing includes 5 one-bedroom units on the second floor and 6 two-bedroom units on the third floor. 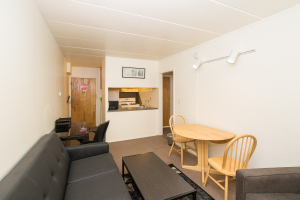 The Harper Wing includes 10 three-bedroom apartments across both floors. As these wings were originally detached buildings, there are significant differences between them. Dotson wing is an older structure with stairs-only while the Harper Wing has an elevator that takes residents from the fourth floor to the basement. Both wings are connected through common areas on the ground floor of each building. 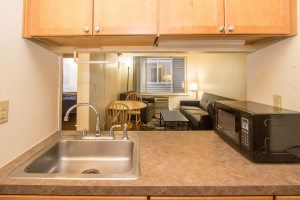 A handicap accessible three-bedroom apartment unit is available on the ground floor of the Harper wing. The common areas include a spacious lounge, kitchen, café, recreation/exercise room, and a meeting area known as the Mpanya Room. The café offers regular subscriptions to popular newspapers and magazines. In addition, the café provides a guest computer, a phone for local dials and a calling card for long-distance calls. 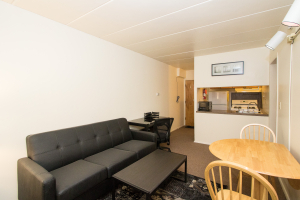 The lounge includes a comfortable living room area, large flat-screen TV with cable, along with a modern kitchen available for resident use. Most to all apartments have excellent internet service. Although great wifi is available, the internet via an ethernet connection is always the most reliable. 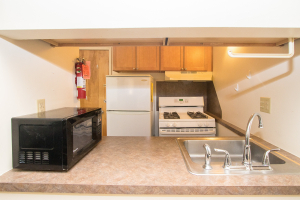 Finally, the Harper wing provides coin-operated laundry machines and assigned storage space in the basement. 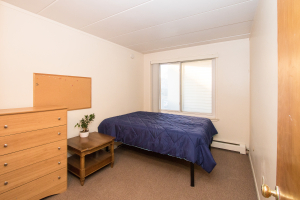 To pursue our mission of being an intentional international intercultural interreligious living learning community, we encourage all of our residents to share apartments with people from different countries than their own. This is why contracts are offered by each individual bedroom, not as an entire apartment (except for 1-bedroom apartments and for families). We find this is an excellent opportunity for residents to explore and learn about other cultures, attitudes, and world views. 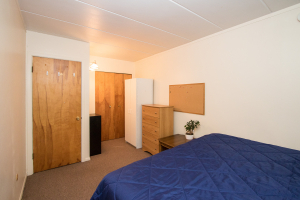 Additionally, this can be helpful for international students coming to the U.S. for the first time who might have trouble finding a roommate before arriving. IHAA will match the person with another apartment mate/s based on each person’s application. Security Deposit: A full month’s rent is due for a security deposit. A security deposit is held in escrow by IHAA until the end of the contract. This covers costs for the repair of damages caused to the apartment property while in possession by the resident. Apartments are carefully inspected for condition by each resident at the beginning of each contract term, and then a move-out inspection is conducted with IHAA at the end of every contract term. Security deposits are refundable within 30 days of departure. 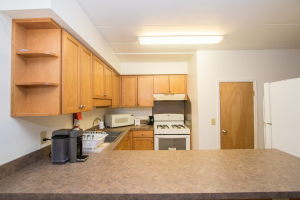 Damages beyond normal wear and tear are deducted from the security deposit. One-Time Preparation Fee: $160 per individual contract. 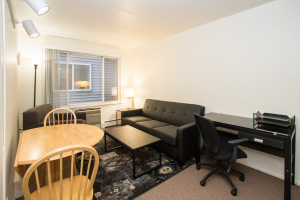 The preparation fee covers various office administrative costs, apartment preparation and cleaning to ensure that each apartment is move-in ready upon each resident’s arrival.